There might be many reasons for which you might need to reset your iPad. For example, when your iPad is not functioning properly due to some technical issues like iPad being sluggish or being too slow or crashes etc. Or you may want to resell it, in such a case you would not want a stranger to access all your personal data stored in your iPad. Therefore iPad reset is of great importance. 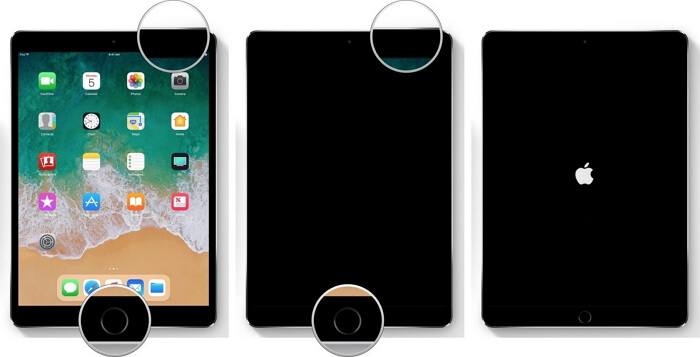 This article will show you different ways on how to reset iPad Pro/Air/mini. It is very essential to reset iPad regularly as it provides a fresh start to your device after wiping off all the data, making your device clean. All iPad users generally keep using their iPad for a long time and just put it to sleep when not in use. Over the time there may be many bugs which would be interfering with the functioning of your iPad. A quick reboot or reset would solve many problems and make your iPad function normally and efficiently again. Many of you would mistake the sleep mode of your iPad to be switched off but it is just in power saving mode and this would not fix the technical issues on your iPad. If you are experiencing issues like iPad running slow, lagging, applications crashing randomly and many such minor technical issues, a quick reboot would fix it. You can perform a soft reset or hard reset on your iPad if its screen has frozen. These methods would not make your iPad lose any data. Both the methods are described in detail below. The first thing which you try when your iPad screen is frozen is soft reset. 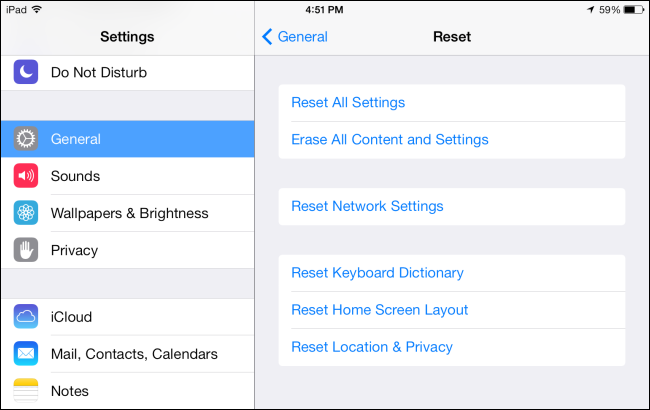 You can know how to reset iPad Mini by following the steps below. Step 1: Press the “Power” button and hold it till the slider appears. Step 2: Slide the slider to the right and after that press and hold the “Power” button to restart your iPad. If soft resetting iPad doesn’t solve the problem, then try hard resetting iPad by following the steps below to know how to hard reset iPad. Step 1: Press and hold the “On/Off” button and “Home” button at the same time. Step 2: Keep holding the buttons till the screen goes blank and then turn on with an Apple logo. If in case your iPad is disabled or you have forgotten the passcode and are locked out of the device or if you simply want to resell the iPad, you can reset the iPad to factory settings by the following three ways. Before doing this, be sure to create a backup so that you don’t lose any important data. 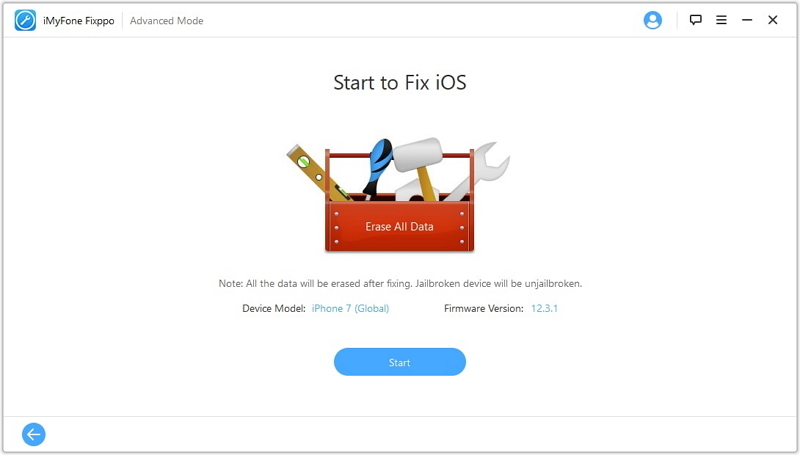 If in case you have forgotten the passcode to unlock your iPad and want to factory reset iPad, you can use the highly recommended iMyFone Fixppo software which easily performs a factory reset of your iPad without the need of passcode. This is a very good software which also has the ability to solve many other technical issues in easy and quick ways. Using Fixppo doesn’t require passcode or Apple ID & password. You don’t have to disable/enable Find My iPhone feature like iTunes/iCloud will do. It can also repair the operating system of your iPad. Now follow the steps below to factory reset your iPad with the help of iMyFone Fixppo. Step 1.Download, install and launch iMyFone Fixppo software on your PC/Mac and click on “Advanced Mode”. Step 2.Connect your iPad and click on “Next”. 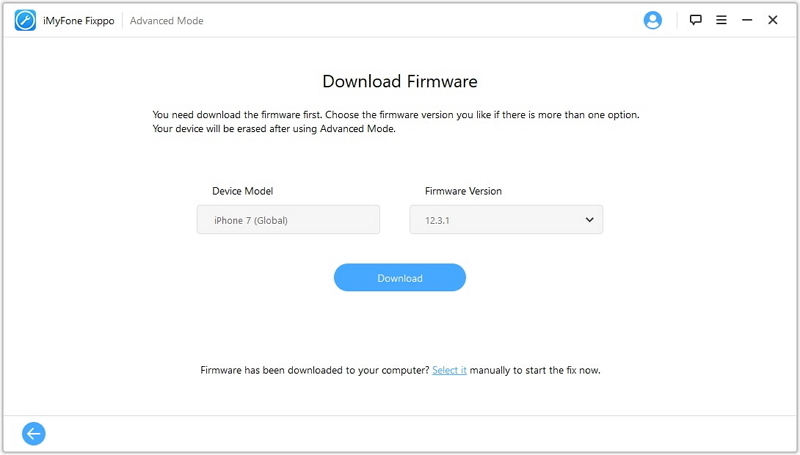 Step 3.Check your iPad model and the firmware version and click on “Download”. Step 4.Click on “Start” to start the factory reset process of your iPad. 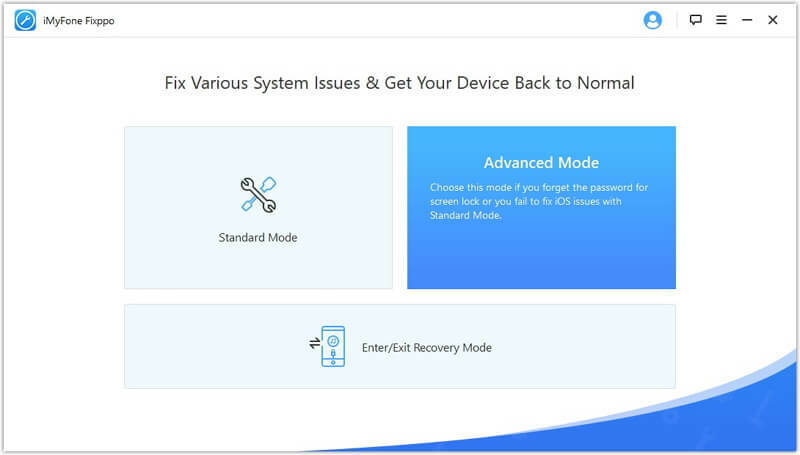 This way with simple steps you can easily factory reset your iPad with the help of Fixppo software from iMyFone. If you remember your passcode and your screen is working properly then you can use the traditional way to factory reset your iPad. Follow the steps below to know how to reset iPad to factory settings. Step 1: From the “Settings” options go to “General” option and navigate to “Reset”. Step 2: Scroll through the options and tap on “Erase All Content and Settings”. Step 3: A pop-up window will appear asking for passcode, Apple ID and password, enter all the details and press “Ok”. Your device will be reset to its factory settings. 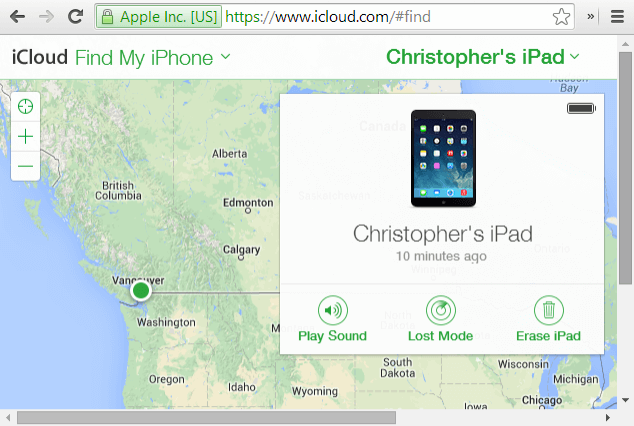 You can restore your iPad to factory settings with the help of iCloud’s Find My iPhone feature. Follow the steps below to know how. Step 1: Login iCloud.com and enter Find my iPhone page. Step 2: Select on the device (your iPad) on which you want to perform the factory reset and erase all the data. Step 3: At the bottom right corner of the screen you can find “Erase” option, tap on that. All the data will be erased from your iPad and it will be reset to its original factory settings. If in case your iPad is not functioning properly the first thing which you must try is a soft reset and if that does not work then you should try a hard reset. If this does not work you will have to perform a factory reset. Factory reset is also the only solution when you have forgotten your iPad’s password or if you want to sell it or give it off to someone. 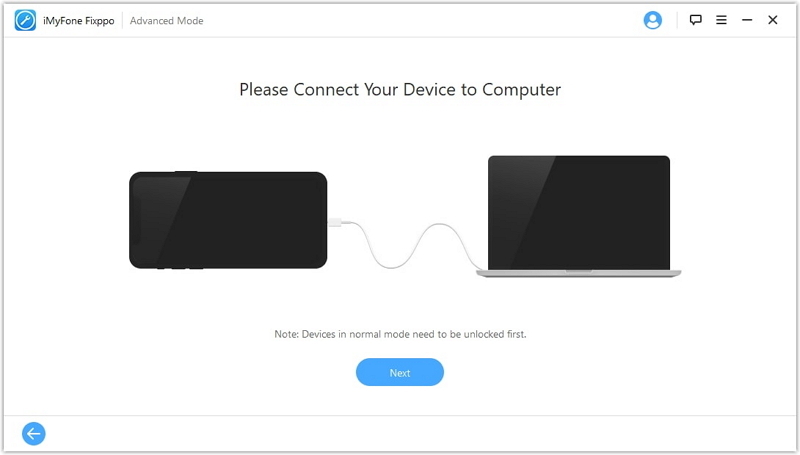 iMyFone Fixppo software’s Advanced Mode performs a factory reset of your iPad in a very simple way without the requirement of a passcode and we highly recommend this stellar software!